Still it is handwriting, a noisy, mechanical concert for fingers and old typewriter. And the keys, angry or hungry hard to tell, bite in the paper like chisels. No ink, only shadows of words and a whispering voice, the artist’s voice. In the late seventies a winter walk on the small mountains at the shoulders of Pisa, in Italy. I walk with a geologist, my lover at the time. Rocks are exposed by the natural sweeping of the wind. Having mapped and named every trail, my guide knows the place like nobody else. He points at a large rock: “See what happened here? The waves shaped the surface; it was underwater in prehistoric times, and you are reading the forms of the waves.” My breathing stopped. As if being underwater, I felt the currents making love to the water, and the waves making love to the sand, and the sand carving undulations on the hard skin of the ground. He had named our trail Ho Chi Min. His father had dug whale bones out of the same mountains, and invented the carbon 14 technique to measure their age. The physicality of this story still strikes me. Liquid time for the wet part of our brains. (Google Nobel Prize Roger-Charles-Louis Guillemin). Let’s move to human writing. 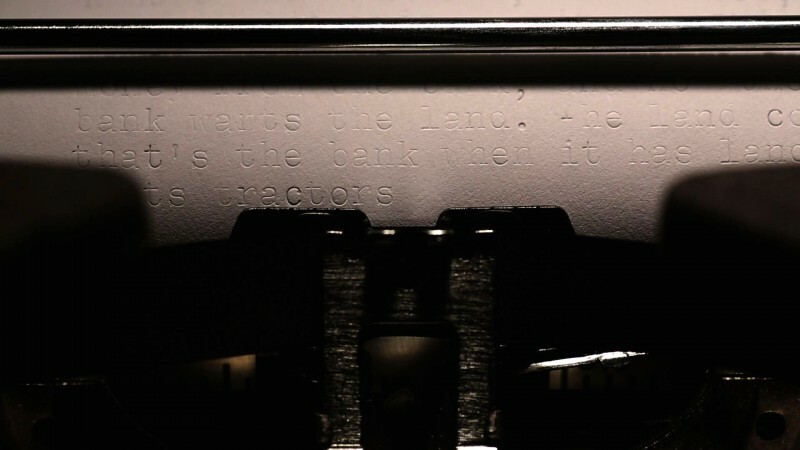 Susan Silton’s manual typewriter and her fingers on the keys, along with other fingers involved in her project, carve signs on paper, instant marks, punctuation is particularly violent and digs holes. Despite the mechanical tool, marks are chiseled like the ancient Persian cuneiform characters on the stones, natural forms of fish or grass becoming words, our brainless conventional marks. We really needed an artist blowing her feelings into the dryness of pages. Bringing us back -it seems to me- to the fluid story of invisible hooks from each word, written or uttered. As we read, listen to, the hooks loop our hidden, undetermined threads together, they knit our inner colors, the coarse or thin flow of the human bundle. They induce a new awareness. Susan Silton: “It all began in 2006; I’d been very distraught about the Iraq War and wasn’t sure how to process all of it. I decided to reread Heart of Darkness, as an action of sorts against the war. Around the same time I picked up a manual typewriter at a garage sale. The machine was in stencil mode when I found it. I knew then that I would reread Heart of Darkness by retyping it without ink. It made the reading physical, intimate. Plus I have a really difficult time retaining what I read, and sometimes will even hyperventilate; so I found that the concentration required to type took the pressure out of me, the typing took over. And the body writes back. Posted on June 11, 2014 June 14, 2014 by turtle2028	This entry was posted in Los Angeles stories. Bookmark the permalink.